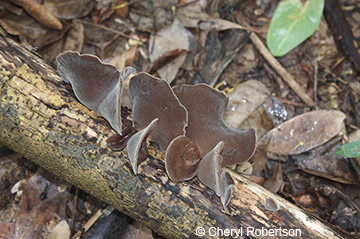 This persistent fungus has a soft pliable gelatinous body, densely covered with short hairs on outside, inside brown with whitish-grey bloom. Ear-like about 10 cm long, body appears pinched into the short stalk (about 7 mm long). Often in clusters on dead wood. Edible after preparation.